"Ten thoroughly pleasant minutes on foot later, I was on Broad Street, the heart of Thomasville's historic, and immaculately-kept commercial district—on a weekday morning, there were visitors staring into appealing shop windows, locals standing on street corners exchanging pleasantries, and a steady stream of everyone, it seemed, coming to and from Grassroots Coffee. Founded back in 2009, they roast in-house here, and the espresso is expertly pulled; a couple doors down, The Bookshelf, a rather alluring independent bookstore, has been a local institution for a couple of decades now; the owners host a podcast, From the Front Porch, as well as occasional Pen to Plate dinners, each time featuring a different cookbook. If I didn't know it already, I'd figured it out by now—Thomasville might be out in the sticks, but this is not a town facing any sort of trouble keeping up with the times." "Owned by Annie Jones, The Bookshelf is a lively, friendly shop that regularly hosts readings, classes, book clubs, and events like 'Cider Monday,' featuring in-store discounts and free hot cider in lieu of the more conventional Cyber Monday that follows Thanksgiving. 'There’s something really magical about a small town at the holidays—when the shop is bustling and the streets are full of people. To be able to have a business on the main street contributing to that magic is my dream come true,' says Jones. 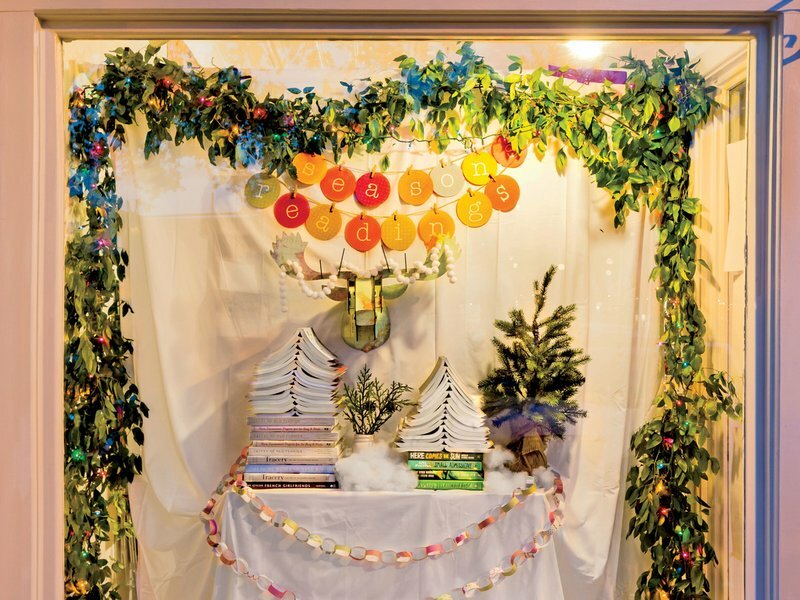 Pop in during the weeks leading up to Christmas to grab a couple of last-minute gifts and to witness the shop transform its regular Saturday children’s story time into a festive, holiday-themed affair." "We're in an off-the-beaten-path location, and it can be tough to get authors to come to our small town, so for Small Business Saturday, we invited other entrepreneurs to come do pop-up shops in our store. We wanted to celebrate small businesses we loved, and it wound up being such a great day. We hosted our local kids' craft studio, which meant 5-year-old entrepreneurs got to sell their handmade goods in our bookstore, and an 11-year-old author signed copies of her self-published book. (We were basically all in tears watching the joy on their faces.) To top it all off, we did a live recording of our store podcast in partnership with The Popcast, a pop culture podcast we're big fans of. It was a jam-packed day, but everything went swimmingly, and we got to partner with so many people we loved. It was perfect." "Annie Jones, owner of The Bookshelf in Thomasville, Georgia, launched From the Front Porch when she took over the store two years ago as a way to introduce herself to the local community. A year ago, she was joined in her weekly conversation about 'books and small business and life in the slow-moving south' by a co-host, Bookshelf bookseller Chris Jensen. 'The goal of the podcast quickly became to expand beyond our Thomasville community and reach out to customers who might not have heard of us before,' said Jones, who said she gets about two to three thousand downloads per episode from all over the country." "Today I'm thrilled to introduce you to my kindred bookish internet spirit Annie Jones. Annie is an indie bookstore owner in Thomasville, Georgia. In this episode we talk about her crazy unlikely path to bookstore ownership, her love of dysfunctional family literature, and how meeting readers and authors in person changes the way you experience a book. I'm guessing you'll also be happy to hear that unlike lots of guests, Annie has LOTS of books she doesn't like." "Jones took over management of Thomasville, Georgia’s bookshop The Bookshelf in 2013. Since then, we’ve been continually impressed with her entrepreneurial spirit, creative inspiration, and rock-solid daily reading picks available through her blog, on social media and by listening to From the Front Porch, her podcast. With fun in-store events like a letter-writing club and an adult coloring book night, plus frequent author visits and collaborations with her local library and community organizations, Jones exemplifies the best of small-town shopkeeping and Southern charm." "The Bookshelf (126 S. Broad Street, 229-228-7767) has been a town fixture for over 30 years. Boasting an exceptionally curated selection of fiction, nonfiction and children's books, the store also offers a wide variety of gifts for book lovers." "A part of Thomasville, Georgia, since 1984, The Bookshelf and Gallery has undergone many transformations but has always maintained its same purpose, said co-owner Annie Jones, 'to celebrate good books and good conversations in a small-town setting.' Five years ago, Katie Chastain and her husband, Scott, took over the bookstore, and 'they made it what it is today,' said Jones, and that included bringing the inventory up to date and creating a gathering place for the community. 'They spent a lot of time and effort making it a Main Street staple.'"